This is my latest art installation and it is on display from the Opening on the 31st August 2017 until 28th February 2018. The humble rabbit is my vehicle to shine a light on man’s moral ambiguity. Why are some animal’s food and some not? Why is it ok to eat ‘X’ animal in this country but not in another? Why are some pets, pests and food at the same time? Who decides and why is it accepted? 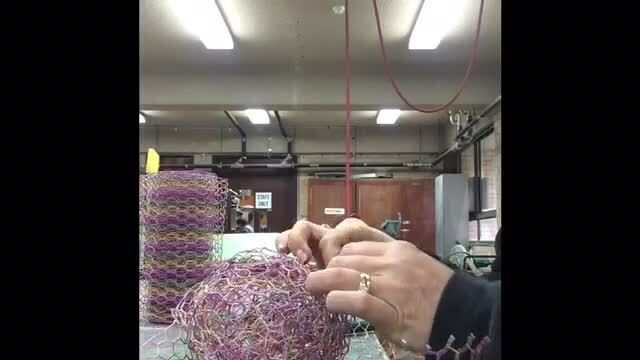 Below is a video of one of the bunnies being made at The Sydney Gallery School. Once these bunnies and a few extras go to new homes there will be no more as the wire I have is as rare as hens teeth. Originally imported from Germany to be used in floristry, these beautiful rolls of high quality PVC coated wire (and some gorgeous metallic coated rolls) languished in a storage shed until I stumbled across them at a garage sale. I took one look and thought wow I can do something with those! I bought the lot and they then hid in boxes in my studio for many years finally emerging into rabbits over the last wee while, as I could not think of a better material to embody the spirit of the rabbit. Tough, wiry, flexible yet strong and coming in a multitude of colours this wire is the perfect fit (and imported to boot). Unfortunately I have not found the original supplier or any other versions that are close so as I said before once they're gone, they're gone! If you like a rabbit in the exhibition and can't wait 6 months for him/her to move into your home, there is the possibility that I can make a similar one (if I have that particular wire left). Feel free to contact me via the form or on 0402 305 345.